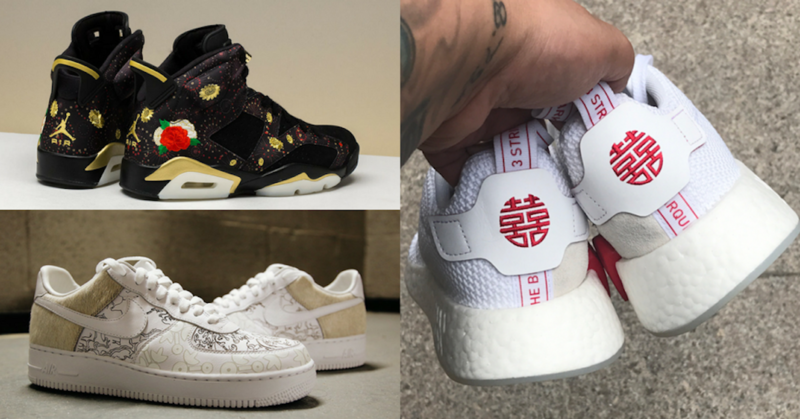 Chinese New Year is around the corner and you know what that means – new limited-edition drops from brands like Adidas, Nike and Vans are on the way. It features a white-based upper with contrasting red accents throughout, the conventional CNY colors. Chinese characters can be found on the heel and insole. The clean and fresh look is completed by its signature full-length Boost midsole and a translucent outsole. A special Chinese New Year colorway, the Ultra Boost 4.0 sports red and black knit upper with a very vibrant red outsole. It embraces the Chinese heritage most on the tongue logo – instead of the conventional Adidas logo, it features a Chinese character in jaws of sharp teeth. Another little detail is a sort of camo print on the laces and interior of the shoe. The Jordan Brand will continue its an annual tradition by releasing an all new make-up of the Air Jordan 6 to usher in the Year of the Dog. It features a mix of black, summit white and metallic gold with muticolor detailing. It sports floral prints as detailing as well as minor floral embroidery. An update on the original 2006 YOTD release, it features Chinese characters representing the Tibetan mastiff on the hell and pony hair representing the massive dog breed. The graphics on the toe mudguard are inspired by the interior artwork of temples. The lasering is inspired by the “Tangta” graphic, a Tibetan pattern that expresses good fortune. The 2018 version opted for a cleaner and minimalistic look, while showing clear homage to its predecessor as well. This floral embroidered pair will be part of the CNY lineup. The shoe is red-based, with a black Swoosh branding and contrasting white outsole. Not much official pictures were released about this drop so the release date is expected to be later than the rest in the lineup. With a black leather finish, tonal paisley accents on the mudguard with hints of red and yellow on the tongue and side panel Swoosh logo as well as Nike Air branding on the heel. Vans collaborated with SANKUANZ for Chinese New Year with an assortment of classic footwear and apparel staples. The theme of the collection is “REBEL TEEH | DO NOT PET ME I AM AGGRESSIVE”. The capsule consists of the Classic Slip-On, Old Skool, Era and Style 36 styles – each featuring the theme phrase or an all-over dog jaw design. Will you be copping any of these?